Booking Nigella Lawson will cook up a storm at your special event! We are a booking agent for Nigella Lawson and can arrange for her to cook for your guests. Writer, broadcaster, television host and domestic goddess, Nigella Lawson has invited the nation into her kitchen on many occasions as she shares her indulgent recipes and passion for food. Although cooking has been a much-loved indulgence by Nigella Lawson throughout her life, she first started as a writer. Beginning in publishing she soon found her calling as a restaurant critic before she was offered the position of Deputy Literary Editor at the Sunday Times. However, she soon returned to her roots as a writer, preferring the freedom and creativity it allowed her. As a freelance writer Nigella Lawson wrote for publications such as The Observer, The Daily Telegraph and The Evening Standard, with columns in both Vogue and The Times Magazine. Nigella Lawson first graced the small screen when she hosted her own show ‘Nigella Bites’ in 1999, her natural charisma and enthusiasm led to the show taking off in a big way, with many critics admiring her relaxed and irresistibly charming approach to cooking. The first series alone averaged over 1.9 million viewers per episode and won her an accolade for Best Television Food Show at the World Food Media Awards. 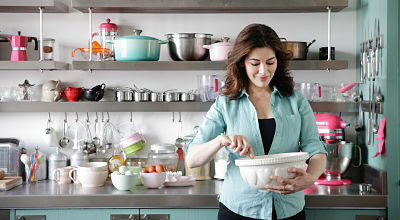 Soon after Nigella Lawson also released her famed second book ‘How to Be a Domestic Goddess’ in 2000, again she encourages her readers to enjoy the process of cooking and creating something delicious, taking away the quick and clinical efficiency that many people have adopted and re-introducing a more relaxed and indulgent approach to the kitchen. The book followed the success of her first and became another best-seller, with over 180,000 copies sold in the first four months and winning Nigella Lawson the Author of the Year at the British Book Awards. The popularity of ‘Nigella Bites’ subsequently led to the creation of an accompanying book of the same name, adding to her list of best-sellers after selling over 300,000 copies and winning a WHSmith Award for Lifestyle Book of the Year. The same year the series was commissioned to run in the US and after expanding her fan base even more, found her book also ranking at number two on the Christmas bestsellers of 2002. That same year she also bought a successful line of kitchenware called ‘Living Kitchen’ and saw the airing of her second television series, ‘Forever Summer’. With a fifth book out and word spreading like wildfire about her kitchen talents, Nigella Lawson was soon at the top of every celebrities list, with everyone clamouring for a taste of her cooking. She was invited by the prime minister to oversee the menu and preparation for him and George W. Bush for the dinner during the presidential visit. She has also flown overseas to the US to appear on prestigious celebrity host Ellen Degeneres’ show. 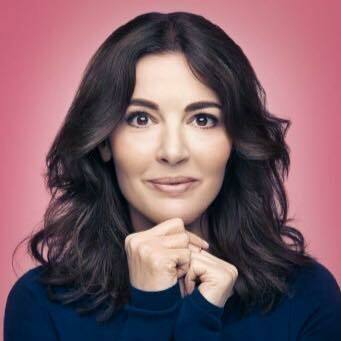 Her on screen presence and likeability also led to her own chat show, aired in 2005 Nigella Lawson would interview celebrity guests about topics such as food, beauty and parenting. However, the following year, she returned to her much-loved format with another new series ‘Nigella Feasts’ which aired in the US for 13 weeks, then had a 3-part special on BBC2 called Nigella’s Christmas Kitchen which was extremely well-received, debuting to over 3.5 million viewers. It was clear Nigella Lawson had her fans hungry for more. Nigella Lawson has proved herself to be an exceptional influence in the world of cooking, her distinct love for the culinary arts while maintaining a sense of accessibility and connection with the public makes her an extraordinary popular figure that many of her fans listen to devotedly. This means that her word can be gospel and any advice given about food is usually taken to heart. This has resulted in Nigella Lawson influencing sales of certain products such as goose fat, which doubled in sales at supermarkets after she recommended it for a Christmas dish, and Riesling wine also had an increase after she used it in a recipe on Nigella Express. She has gone on to do two more series; Emmy-nominated Nigella Express and Nigellissima, the latter looking at Italian cuisine, with Nigella Lawson aiming to capture the spirit and essence of the country in her recipes, inspired by the gap-year she spent there. She also published two books alongside each of the series which were also bestsellers. Contraband is the UK’s top booking agent, with amiable, skilled account managers who guarantee you the best deal possible. Contact us today if you would like to book Nigella Lawson to be the headline of your event! As your booking agent we are more than happy to help you create the most memorable moments with Nigella Lawson.